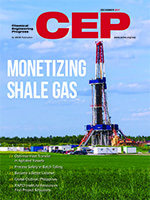 This month's cover story presents an order-of-magnitude correlation for estimating the capital investment required for a shale-gas monetization plant. Other topics in this issue include optimize heat transfer in agitated vessels; process safety in batch tolling; become a better listener; the Philippine chemical industry; and RAPID Institute announces first 25 projects. Batch tolling facilities can use process safety management techniques to meet regulatory standards and minimize risks.